The 2016 Rio Olympic Games may have lasted from August 5th to August 21st, but they were a long time in the making. Throughout the process they have been subject to many controversies. For instance, on August 17th, the Telegraph published an article deeming the 2016 Rio Olympics to be the “worst” ever at anti-doping measures. Rio officials attributed this to the unexpected lack of support from volunteers. Only 70 percent of the volunteers that signed up showed up, and some only stayed until they got their free meal. CBC’s report on the Olympic diving pool came out on August 12th. When Rio officials confirmed the pool had indeed turned green and that it would be closed for training. Measures were taken to allow the water to return to its original blue color before the competition. Several athletes complained about the water; British diver Tom Daley, said on Twitter that he hoped they hadn’t been diving in “anything too bad” and Abby Johnston, a swimmer from the U.S, suggested that #FixTheSwamp should start trending on Twitter. Brazil’s economic issues are no small matter. Fortune Magazine analyzed the details behind the country’s almost three year long, and ongoing financial crisis. Not to mention the fact that Rio de Janeiro, the host city, has declared that they are in a state of financial emergency. Mark Mobius (emerging Markets investor) and colleague Gustavo Stenzel argue that the economy is currently at its worst and only beginning to hint at regrowth. Some critics argue that spending over $15 billion on infrastructure will only add stress to the already bad situation, while others maintain that it might help kickstart the economy and help it bounce back. The economic problems have visible effects. 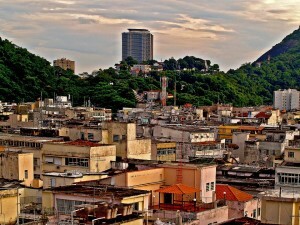 Since 2010, an “acoustic barrier” was placed around the slums, also known as favelas, and were covered in little over R$200000 (Can$80000) worth of “decoration”. Locals have allegedly branded this “The Wall of Shame” and The Telegraph theorizes that the partition is meant to hide the cruel reality of the favelas behind the thematic Olympic colors. Residents of the favelas say that the only change they have seen, thanks to the the Olympics, is an increase of violent police raids against drug traffickers. There was also fear surrounding the possibility that travelers might bring the Zika virus to their home country as they returned from Brazil. The Guardian reports that 150 academics called for the Rio Games to be moved or postponed. A research team from the Yale School of Public Health decided to conduct their own studies. Joseph Lewnard, the study’s lead author, explains that the risk of contracting the virus is lower than negligible. “I would expect it to be far lower than the numbers we present”, he added. Between green pools and far more serious economic issues the Rio Games had the odds stacked against them but they somehow managed to bring it all together. The medals may have been won, the closing ceremony might have already taken place, but the long term effect of the 2016 Rio Olympics remains to be seen.